Every winter, whenever wedding professionals gather, you hear the same comments. "My bookings are down for the year." "I only have three weddings booked for the entire summer." "If I don't book something soon, I'm worried I'll have to go and get a job!" Take a look at your business's trends - do you see that same cycle? There is hope! Don't give up! Instead, make the most of this slow season in your business. Instead of sitting around and binge-watching the latest series on Netflix, now is the PERFECT time to do one thing that will impact the bottom line of your business - review your prices! There are a long list of factors that go in to how you price your services, and it is important to remember that once you set your rates? You can't just set it and forget it. Have any of your vendor costs gone up? Have you changed vendors or products but left your rates the same? It is easy to start working with a new supplier during the busy season and never go back to adjust your rates. The price difference may be small per wedding, but over the year it makes a big difference. Are your prices profitable where they are currently set? Part of setting your rates is accounting for time to complete tasks and other items. This requires that you estimate how long things will take, and you may find that your estimates were wrong originally. Now is the time to adjust for that. This isn't just about paying yourself; as you get busier, you may want to outsource projects or hire help, and you need to make sure you have budgeted to pay for that work. Have you ever increased your rates, or are your clients paying today the same thing clients paid 3-5 years ago? Have you adjusted for inflation? It is tempting to keep your rates exactly the same if they are working. Pricing can be an emotional process, and it is scary to adjust them because you could see a dip in your bookings. 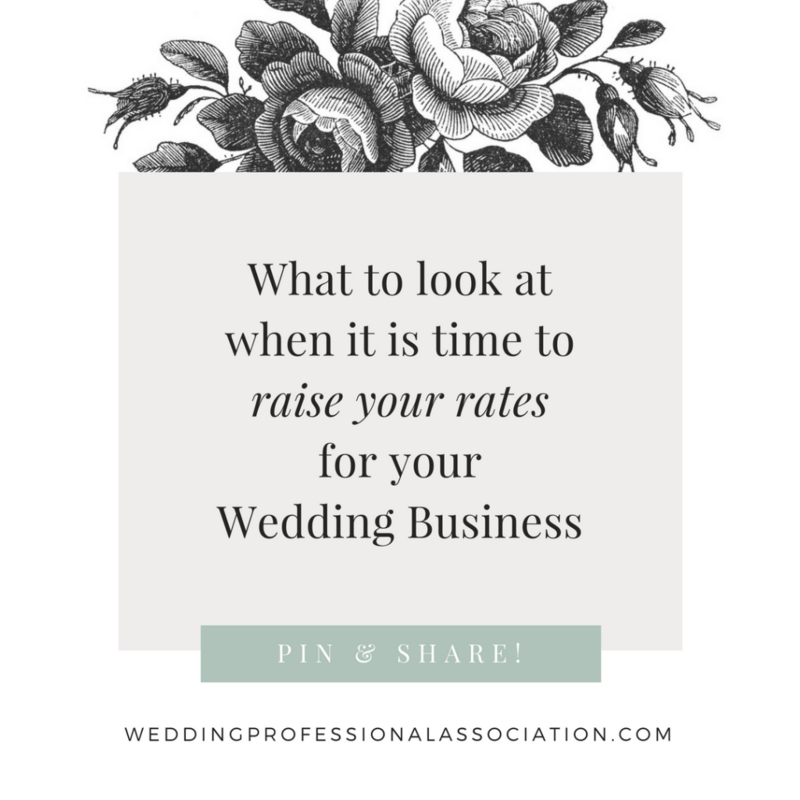 If you're concerned, instead of a big price jump, try raising your rates in small increments; a small amount after every 4 weddings booked, for example. That way, the jump won't be so sudden and clients likely won't notice. Have you adjusted your prices to align with the market? If you were priced towards the top of the market, are you still? Or have others raised their rates to be more than yours? Do you need to raise them to be more closely aligned to your peers and referral network? People will not normally refer potential clients to you if your rates are substantially lower than theirs. Do your prices bring in the type of clients that you enjoy working with the most? Knowing who your Ideal Client is is key here, and you should make sure that you're not offering a budget price to someone who is expecting to pay more than that. Your price sets expectations of your level of service. Do your rates match your brand? If you say that you're a luxury brand, are you charging luxury rates? If you're the perfect professional for the indie couple that is having a small, intimate wedding in a park, would they pay what your fees? Is there a disconnect between your marketing message and the prices you charge? How much do you pay yourself for the work that you do? 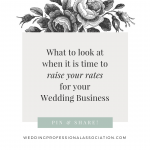 This may be the most important one, and the one that many wedding professionals skip right over. Are you cutting yourself a paycheck each month, and is it enough to live off of? Have your personal expenses changed? Do you need to give yourself a raise? Once you have adjusted your prices as needed, review all client marketing materials. Make sure any pricelists, web pages, contact forms, flyers that you pass out, anything that has a price on it is updated to reflect your new rates. What about clients who have already inquired? Your pricelists should state that they are subject to change - you don't want to be locked in to a price if someone waits 3 months to book after your first meeting. What if a supplier doubles their rates, and you have to double yours? For clients who have already met with you, or ones you have already sent a pricelist to if you provide them before meetings, let them know right away about the change that you're making. Set a time limit for how long they have to book. For example, when I had outstanding inquiries for my wedding photography business, I emailed everyone who had the current rates and let them know that I would honor them for 14 days. If they booked after the 14 days, they would be booking under my new rates. An important side note: do NOT do this as a fake tactic just to pressure them in to booking! Ugh! If you do, as soon as word gets out that you do this? Clients will run from you as fast as they can. People that are planning their wedding talk to others who are planning too, and word will spread like wildfire. If you say you're raising your rates? You have to do it. HAVE TO do it. How did your pricing review go? Are you raising your rates? Leave a comment and tell us what you discovered in the review!